Are wasps active at night? Jump Menu: Are wasps active at night? Why do we see wasps in the house? I have a wasp nest under the shed, what should I do? How much does it cost to have a wasp nest treated? Do wasps have white bottoms? Wasps do not sleep in the same way as mammals do. They do not fly at night, and they return to their nest where they stay dormant, unlike hornets which are nocturnal. If you have large insects banging on your windows at night time, it will most probably be hornets, indicating a nest is close. Wasps are active at night but are confined to the nest, carrying out nest duties such as tending to larvae and nest repair. Often customers report noises coming from a nest during the night; this sound is from the young wasp larvae. Worker wasps also make noise as they make repairs to the nest during the night. In mid to late summer when wasps nests are getting large, the workers are desperate to get out of the nest first thing in the morning. Often they are attracted to bathroom lights and open windows just before sunrise. Why do we see wasps in the house? If you have wasps getting inside your home, depending on the time of year, you either have an active wasp nest somewhere in the house (probably the loft), or you have hibernating queens in the attic. Modern houses often have downlights in the ceiling; these lights shine into the loft as well as down into the room. Wasps are attracted to the lights just like moths are. Often wasps can squeeze between the bulb and the fitting and get into the house. Bad fitting loft hatches can also be a problem, or any other gaps or hole in the ceilings give potential access points for wasps to get into the house. If it is summer time and you have wasps getting indoors regularly, take a look at your roof from outside, if you have an active nest, you will see wasps coming and going to a particular point on the roof. If it is winter and you are getting large wasps inside, this means you have hibernating queen wasps which are waking up due to a rise in temperature. I have a wasp nest under the shed, what should I do? If you have a wasp nest in an awkward place and want it treated, we can help. We often treat nests under patios, sheds, houses. We have even dealt with wasp nests in the sides of hot tubs, old vehicles, tractors and various other places. We have never failed to treat an active nest no matter where situated. How much does it cost to have a wasp nest treated? Hampshire Wasp Control has a set fee of £45 to treat a wasp or hornet nest regardless of its location, there is no VAT or other extra charges. Do wasps have white bottoms? Wasps do not have white bottoms. 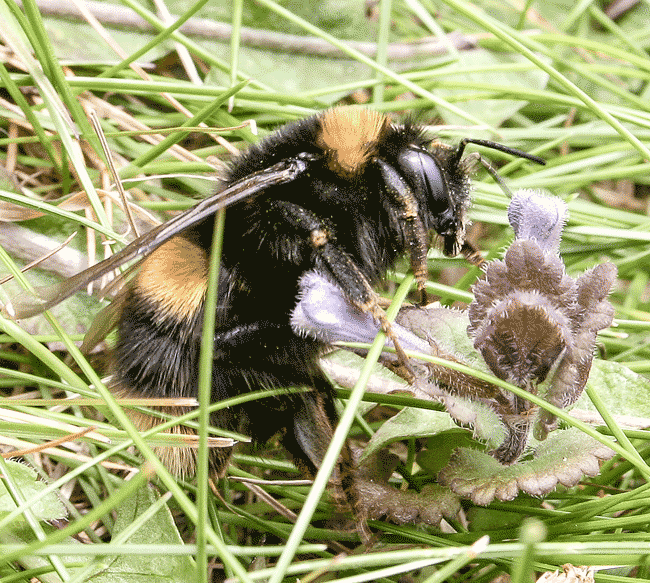 However, whitetail bumblebees do have white bottoms. Please take a look at our identification page; we have put some images up to help you establish which insect you have.